In the early spring of 1973, if you were to drive west along Chelmsford‘s Route 110, just beyond the Lowell city line, you wouldn’t get far before you came across a large clearing outside your driver’s side window. Masses of steel would be shooting skyward, well back on a newly-cleared 12-acre parcel of land. With locations in Nashua, Salem NH, and Chelmsford, Child World saw the spending of many childhood allowances during the 70's and 80's. There might even be a sign, advertising the fate of the new development – not far from the junction of Rtes. 3 and 495. A “Neighborhood Mall” is planned, and with it, Child World and Bradlees Department Store are both coming to Chelmsford. A Stop & Shop Grocery Store also announced plans to move into the new mall. A lot of excitement surrounded the mall’s opening. “Who wants to go downtown? Who wants to drive all the way to Burlington?” quipped one man to the Lowell Sun in early 1973. With construction beginning around December 1972, the mall was seen as a welcome alternative to the at-times sweltering, and at-times freezing, streets of downtown Lowell, or the larger and more distant Burlington Mall some miles down Route 3. The idea of a mall at the site actually surfaced as early as 1970, but several hurdles needed to be cleared before construction even started. First, no less than 14 separate parcels of land needed to be purchased. Later, the project was almost derailed (and ended up being delayed for two months) by the Conservation Commission, while the question of wetlands found on the site was discussed. Originally opened as the Neighborhood Mall, the Chelmsford Mall acquired its current name soon after opening. The seventies sure were different times. . . .
Construction continued through the spring and summer of 1973, and the mall was scheduled to open that October. That large parcel of land along Chelmsford’s Route 110 eventually came to accommodate 1,200 cars and a ‘huge’ mall, as it was then called. 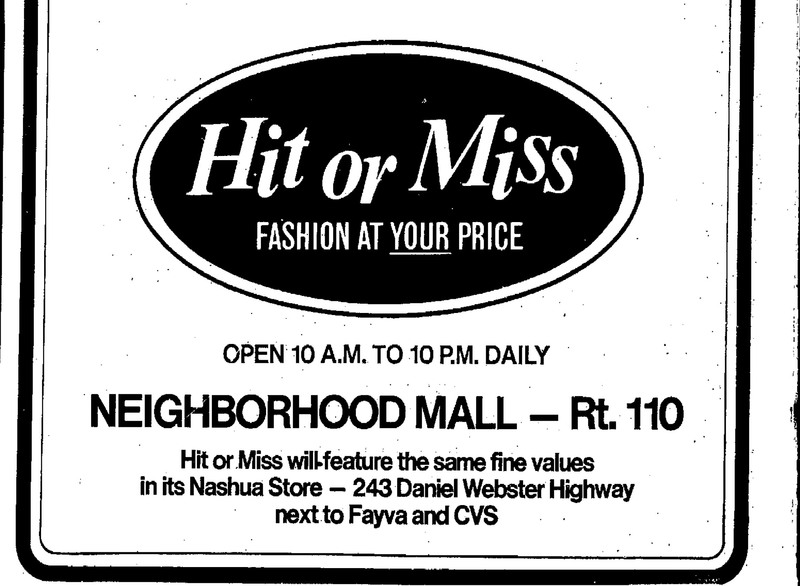 In addition to Child World, Bradlees, and a Stop and Shop, the mall also housed some 25 speciality stores, including Hit or Miss, Radio Shack, and Fayva. A Stop and Shop in Chelmsford on 110? Deja Vu? No, this ad heralds the opening of a Stop and Shop location at the Chelmsford Mall on February 4, 1974. I remember the original Chelmsford Mall very well. As you looked at it from Route 110, Bradlees was to the right where Kohl’s is now, and Child World was to left, about where Michaels or the shoe store is. There was a common interior hall that ran from left to right. Right inside the main entrance, where Best Fitness is now, there was a Baskin Robbins ice cream shop. Along the back part of the common hall was a bookstore – Paperback Booksmith, perhaps? Then way down to the left where Staples is now there was a regional big box hardware store the name of which I forget. It was a predecessor to the Home Depot/Lowe’s model. The store was named “Channel”. Ah – Baskin Robbins – they moved down the road further into Chelmsford for a while, in the 90’s. I remember the bookstore too. Just across from the Baskin Robbins, at least in the 80’s, was a hobby shop. I don’t remember its name. A quick question for those who remember the original Chelmsford Mall. 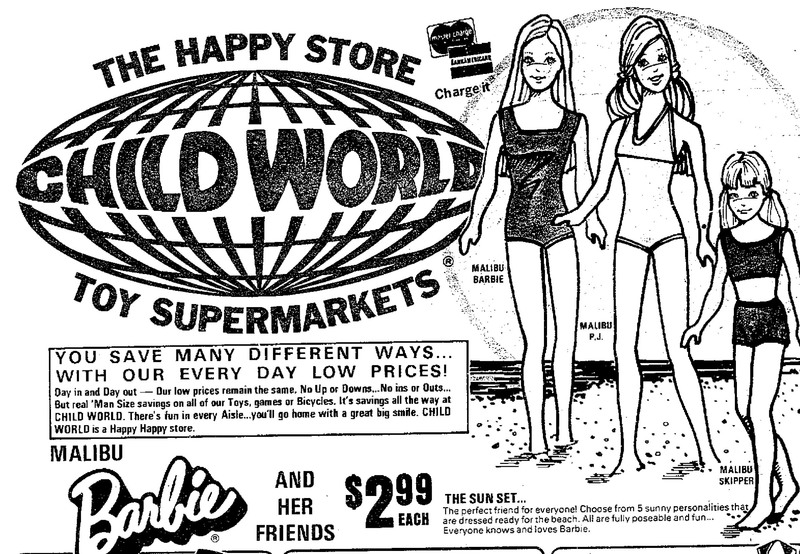 I remember two anchor stores in the 80’s – Child World and Bradlees. I don’t remember Channel, the hardware store, or the Stop & Shop that the Bradlees ad records as opening in 1974. That Stop & Shop couldn’t have been there too long. Hey Ryan, sorry I haven’t visited in awhile. Yep, at this time shopping was moving from downtown to the ‘burbs. I love how you integrate history and social demographics into genealogy. I loved Hit or Miss. I bought suits there and put them on layaway, paying a little every week until they were paid off. They had great in-between season sales, too. I forgot all about Fayva shoes! There was a music store in there too that sold all kinds of instruments including large pianos. That was a common thing in those days, so much so that a stand-up comedian included the absurdity of it in one of his bits where he says he told his wife while walking in the mall to “wait, before we leave I’m going to pick up a piano.” Back then, malls were considered places where you would buy things you could take away with you on the spot. I remember Channel, bought some superglue and some picture hangers one time, but I only vaguely remember Stop and Shop being there, probably because I was too young to shop for food at the time when it was there. Later in the early 90’s there was a store in that space called F&M that sold everything from housewares, to beauty supplies, to baby stuff and so much more, all for cheap. It was a fun store. My grand aunt used to call it “that F& store,” which came out really funny. I still use a big boar’s hair bristle hair brush that I bought there. Hi Karen – it’s good to hear that someone remembers the Stop & Shop at the Chelmsford Mall. I couldn’t picture where it was or could have been. I’m thinking it must have been in Channel’s spot, where the Staples is now. So-Fro fabric store was there. That was when there were at least 3 fabric stores in town. The Silver Thimble was in Parlmont Plaza. There was one at Drum Hill, but I can’t remember its name. I remember riding my bike inside the mall when it was under construction. There was also a GAP, smoke shop, Garden of Eden and a tiki hut that made the best blender drinks. Thanks for the trip down memory lane, we used to visit that mall a lot when I was a kid, now I work just down the street from there. I miss Child World and Bradlees. However, I do not remember the Stop & Shop being there at all. For a while there a was an old Bradlees cargo container (from the back of a semi) parked near the Target in Leominster, but sadly it disappeared a couple years ago as well. I’d love to see you write up a piece on Whalom Park. Thanks Brett – great idea about Whalom Park. I’ll look into that. Benson’s would be an interesting post too. Stop and Shop was in there to the extreme left maybe two years at most. Replaced by ‘The Food Outlet’ (great homemade peanut butter! ), then Channel, then F&M. I worked at Child World there from ’85-’92. A great mall for it’s time. The opening of Pheasant Lane Mall in 1986 spelled the beginning of the end for this unique ‘Neighborhood Mall’. Hi Scott – thanks for stopping by. I remember Channel and F&M. I had forgotten about The Food Outlet. As great as the Pheasant Lane seemed when it opened in 1986, it just never had a store quite like Child World. The bookstore was Waldenbooks! I used to go there all the time, and I bought some really interesting books there when I was young (dirty joke books, LOL…). And right next to Waldenbooks was a small pet store. I got my kitten there. Man, I’d totally forgotten about the music shop. I got some sheet music there once. My mother used to dump me at Child World while she went shopping at Fayva and Hit or Miss. Gah…I feel really, really old. I do remember at one point there was a women’s clothing store in there called Maryanne’s. They had all sizes from small to plus sizes. I loved that store! I worked at Wood Abbott Jewelers one of the original stores in the mall at the Bradlees end.Next to us was a store called You& You later to be renamed The Gap across from us was The Village Bazar a gift shop,Debbys pet land came later,also there was Curtis Music then renamed the Music Mall ,So Fro Fabrics, The Garden of Eden a hair salon,Gloria Stevens a womens fitness salon,Paperback book smith,The Big L it was like a cvs store and Putmans Hallmark store, Merle Norman was there for awhile and Smokers Corner. The Tiki Hut was the only place to get something to eat or drink besides Baskin Robbins. Later Bradlees was able to open a snack bar but that didn’t happen until the eighties. I remember not being able to park in that huge lot at Christime that was how busy the mall was in those days. I worked at Wood Abbott Jewelers one of the original stores in the mall at the Bradlees end.Next to us was a store called You& You later to be renamed The Gap across from us was The Village Bazar a gift shop,Debbys pet land came later,also there was Curtis Music then renamed the Music Mall ,So Fro Fabrics, The Garden of Eden a hair salon,Gloria Stevens a womens fitness salon,Paperback book smith,The Big L it was like a cvs store and Putmans Hallmark store, Merle Norman was there for awhile and Smokers Corner. The Tiki Hut was the only place to get something to eat or drink besides Baskin Robbins. Later Bradlees was able to open a snack bar but that didn’t happen until the eighties. I remember a hobby store there as well down near Bradlees. My first regular job was at Bradlees in 77 or 78. I enjoyed being there.